MENDOCINO Co., 6/14/18 — Negie Fallis, the prime suspect in the disappearance of missing Covelo woman Khadijah Britton, will appear in court on Friday at 10 a.m. for his preliminary hearing for a charge of being a felon in possession of a firearm. This charge is the last remaining charge against Fallis since Mendocino County District Attorney David Eyster dropped the charges of domestic violence and kidnapping, during a court proceeding on Monday. Fallis has been in jail since his arrest on February 19 for an outstanding warrant, stemming from a January incident in which he allegedly beat Khadijah Britton with a hammer and threatened to kill her. That case, which was dropped Monday, could be re-filed by the DA in the future. Britton, the primary witness in the January incident, has not been seen since February 7, and her disappearance has elicited an outpouring of support from the community. The investigation into her disappearance remains ongoing, with no case yet brought to the court. Fallis’ bail, which previously stood at $400,000 despite his public defender’s appeals, is now set at $35,000 in accordance with the standard bail schedule. On Monday, as they have for all of Fallis’ court appearances, many family members and friends of Britton’s sat in the courtroom wearing shirts and pins with her photo and phrases including “Break the silence,” “Bring Khadijah home,” and “MMIW,” which references the international movement to raise awareness about the high rates of missing and murdered indigenous women in the U.S. and Canada. Britton’s mother and others began crying as Eyster noted that he would be dropping the assault and kidnapping case, which many in the community had seen as the best hope for prosecuting Fallis’ alleged abuses against Britton until she is found. Fallis’ preliminary hearing on the firearm charges was scheduled for Wednesday, June 13, but was moved to Friday during a separate court proceeding yesterday, Wed. June 13. The delay was the result of a potential conflict of interest raised by D.A. Eyster against Fallis’ public defender, Christiane Hipps, and the hearing was moved to give Hipps time to review the possible conflict. The conflict raised by Eyster at the Wednesday proceeding, hinged on the fact that Hipps previously represented a witness in the county’s case against Fallis, his sister, who Eyster said would testify that she provided Fallis with the firearm. The two attorneys could not reach agreement as to whether the information provided by Eyster about the witness had been received with enough time for Hipps to review it, a reoccuring theme in the Fallis court proceedings in previous months. Fallis had previously been scheduled to go to trial on June 4, on the charges of domestic violence and kidnapping, but Eyster dropped those charges on Monday. Eyster made the changes during a hearing set to address a discovery motion brought by Hipps that was initially submitted to the court the week prior. Eyster stated in court that he would drop the charges if he was made aware of a problem in the county’s case against Fallis, which he did on Monday. Hipps filed several motions with the court claiming the D.A. had not provided her with the evidence for both cases against Fallis according to court procedure. In the most recent filing of a discovery motion, Hipps’ claimed that Eyster had not adequately turned over evidence contained in a police report that related to one of the cases against Fallis. In response, Eyster noted he has instructed staff to include said police reports in all relevant cases in the future. The D.A. also mentioned an issue with witnesses when dropping the kidnapping charges. During a June 7 court appearance, Eyster requested additional time to address the most recent discovery motion, saying the law enforcement officers he needed to consult were unavailable due to an ongoing shooting in Boonville. The delay was one in a series of changing court dates and disputes between the attorneys over whether evidence and motions filed were being provided in a timely manner on both sides. On Wednesday, Eyster also raised an issue as to whether there was a potential conflict of interest with Hipps representing Fallis. Eyster noted that Hipps had also represented Fallis’ sister on multiple occasions, who is a witness in the firearm case. Hipps responded that she did not believe there was a conflict, but requested additional time to review the issue. The potential conflict will be addressed in court on Friday prior to the preliminary hearing. 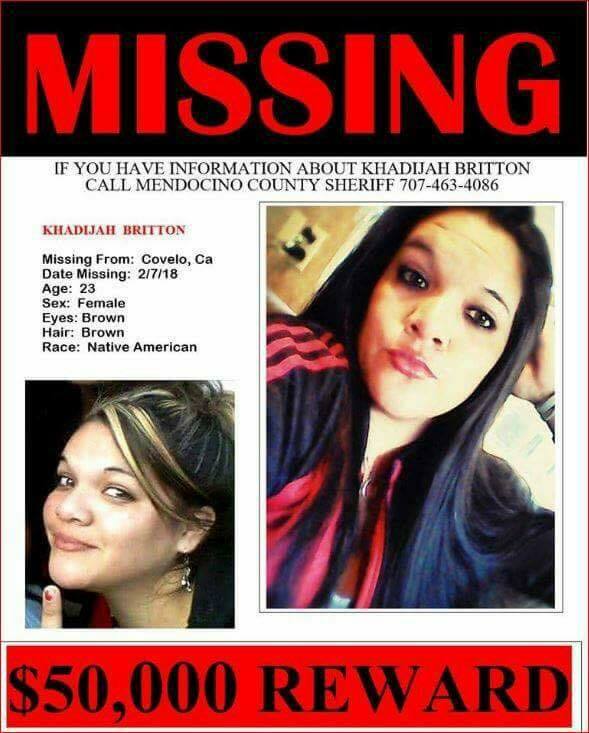 Here’s The Mendocino Voice’s ongoing coverage of Khadijah Britton’s disappearance. Anyone with information about the case is encouraged to contact the Mendocino County Sheriff’s Office at 707.463.4086 or the anonymous tip line at 707.234.2100. A $50,000 reward is being offered for any information leading directly to finding Britton.